Kvas is the most favorite along being refreshing of all Russian beverages. 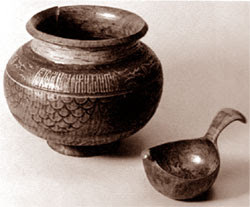 Since antiquity the Slavs have made and known about Kvas since long before the foundation of the Kievian Rus. The word Kvas is Russian, derived from old Ukrainian by origin, literally means sour drink. It was so popular that in the Encyclopedia of Food it was written: "After water, the most widespread beverage was Kvas ... It is thought that people drink it more often than water......" A love to kvas overstepped the limits of classes: poor people drank it with a pleasure as did the nobility whu actually kvas to foreign wines. Kvas was very inexpensive and easy to make. These facts partly, explains its popularity. 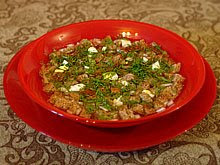 Kvas serves as the base for many dishes in Rus cuisines: okroshka , turya, balanda, etc. It is the superb gustatory qualities of kvas that has surprised foreign visitors to the Rus for centuries. They could not believe that this delicious fermented beverage was as tasty and useful as well as being much better than the sherbets was given to servants as well. Together with sauerkraut, kvas was the only medicine that saved people from scurvy during a long winter without green, as real Russian kvas was made from malt that is notable for rich content of vitamin B and vitamins C. In folk medicine kvas was used for curing cold, dropsy, fever, digestive tract diseases and many others.. In Rus hospitals kvas is a necessary daily beverage for every patient. To increase nutritious value of kvas, it was made from 2 kinds of malt sans sugar. At times people add honey to ennoble kvas. Freshly made kvas is preferred and is what most folk drink. Some lazy women, historically and habitually, managed to make kvas once a year and as required they poured in new water. In the end this kvas had no real resemblence to real kvas and was more like vinegar. There are literally hundreds of thoiusands of recipes of kvas. Actually they have the same ingredientsbut are presnted with different proportions: malt, rye or wheat flour, & boiling water. This dense mass was blended until it had a sweet taste. Then this mass was put in a well-heated oven for a day and a night, 24hours. After that the mass was dissolved in water then left in at room temperature for 2-3 hours. It is then bottled. This is the basics of making kvas. Kvases differ depending upon the different kinds of flour, cold or hot water; additives such as sugar, raisins, honey, mint, berry juices or molasses. Kvas making demands a lot of experience, many skills and special equipment in the form of large, false-bottomed, wooden tubs. Kvas is safer to drink than water. Tolstoy describes how Russian soldiers took a ladle of kvass before venturing from their barracks onto the Moscow streets during a cholera epidemic. Kvas is so well known and used in Rus literature that it demands and gets the respect that is owed to it from people who have tried it and now love it. Because kvass protects against infectious disease, there is no worry about sharing the glass or so they say. 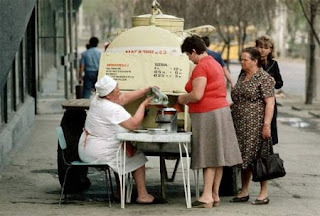 ZVENIGOROD, Russia — Poet Alexander Pushkin wrote that Russians need the drink like they need the air. No, it’s not vodka. It’s called kvas. And despite its humble folk origins, the fermented-bread drink brewed by Russians for more than a thousand years has become a booming multimillion-dollar industry. Western imports like Coca-Cola and Pepsi once stifled the commercial kvas market. But today, a kvas revival has taken hold as Russia’s companies pitch it as a patriotic cola alternative, and Russians are repatriating their tastebuds with gusto. The mildly alcoholic drink, which tastes a bit like a weak beer or wheaty cider, is riding a nationalist resurgence under leader Vladimir Putin, who has boasted of a new era of Russian pride and power. Bottled kvas sales have tripled in the past three years, according to Moscow-based Business Analytica, and Russians will drink more than three liters (0.79 gallons) per person this year. In Moscow, cola’s share of the soft drink market dropped to 32 percent in 2007 from 37 percent in 2005, while kvas’ market share more than doubled over the same period to 16 percent in 2007. But cola makers have a strategy: If you can’t beat kvas, brew it. Coca-Cola Co. introduced its own brand this May, the first time a non-Russian company entered the market as a key producer, and PepsiCo Inc. recently entered a distribution deal with a Russian kvas company. It’s not only Russians’ patriotic palate that has sparked kvas’ revival. New distribution and storage technologies — as well as a heavy dose of Madison Avenue-style marketing — have breathed life into the market, which has seen the entrance of three new major brands since 2004. Once sold only during the summer out of wheeled yellow tanks the size of beer barrels, the drink is now bottled, canned and shipped across the country. Unlike its predecessor, the new kvas does not spoil quickly, and Russians can now buy it year round. While Russians are drinking more kvas, some are enjoying it less. The new mass-produced brands have left many longing for the bread brew of the old days. To find authentic kvas, connoisseurs come to this town about an hour west of Moscow, where in a basement beneath the onion domes of the town’s fifteenth-century Orthodox monastery, a huge refrigerator chills vats of the muddy brown brew. 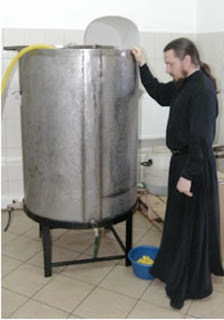 For more than 600 years, monks at the Savvino-Storozhevsky Monastery have been brewing kvas for themselves, and seven years ago they started selling it. Unlike mass-produced varieties, the monastery’s kvas has no preservatives and spoils within five days. As the monks say, it’s “live.” They sneer at competitors with their artificial preservatives. Commercial brewers, meanwhile, pitch their product as the healthy patriotic alternative to unhealthy Western soft drinks. That’s how kvas company Nikola — literally — made a name for itself. Nikola, which means “not cola” in Russian, launched an “anti cola-nization” campaign in Moscow last year that billed its kvas as the Russian alternative to “cola-nist” soft drinks. The company ran ads featuring look-alikes of Michael Jackson and Kiss singer Gene Simmons scaring Russian children and bathers while holding up cola. Then the look-alikes reveal themselves to be “real Russians” and begin drinking kvas. “No to cola-nization. Kvas. To the health of the nation,” the voiceover says. The pitch appears to have worked. Launched in 2005, Nikola soon became Russia’s second-largest kvas seller and retooled the traditional image of the drink. “In our family we have a full ban on Coca-Cola, for both the kids and the adults,” Olga Beglyarova said, after purchasing a bottle of fresh kvas from the monastery. The first time I came across "kvas", I was reading a M. Gorky short story and it was mentioned. I had no idea what it was at the time.